The winner of my little Prairie Schooler giveaway from my last post is Tricia of The Stamper's Stitches blog. Congratulations Tricia! I had to use the random number generator gadget instead of my usual way of letting Karma pick a name out of the hat, because my little parrots unlike me, don't get up before the sun. And these are the two little ornaments I have been working on this week. 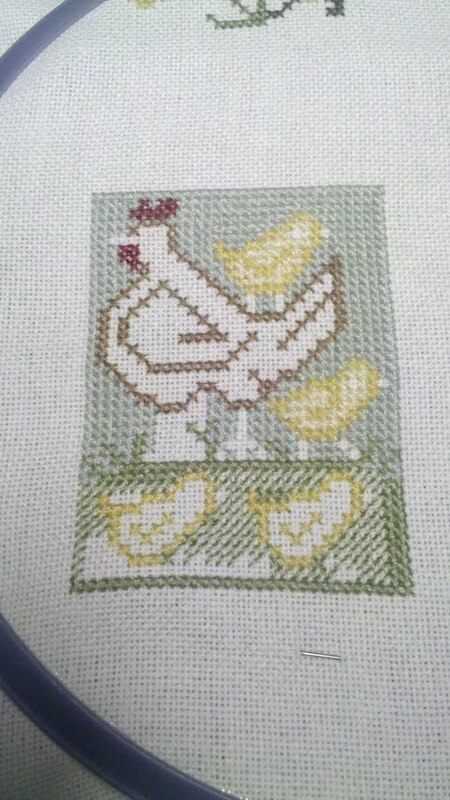 The above one is from Just Hatched, I loved how the flowers/chicks matched the larger PS chicken piece I just finished. 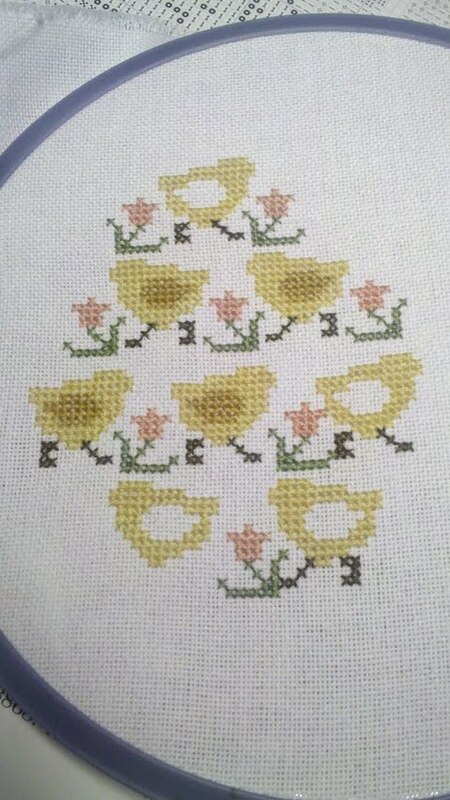 And below is another little chick ornament off of the Bunnies and Chicks chart from my giveaway. It has been so cold here I am longing for warm spring weather. I have my spring wall almost completely done up, just waiting to get my new finish back from the framers and I will post some photos of it. Oh my, this was the very last thing I wanted to work on this week. But thanks to everyone who commented on my last post I can now add this to my "FINALLY FINISHED" list for the year. Thank you for all the motivation. And honestly it really did take me less than two hours to finish all 24 chicks wings and sew on some seed beads for their eyes. I am excited to send this off to be framed this week, and hopefully have it back and hanging for my spring wall. Yes, I have a wall in my dining room that I switch out with seasonal decorations/stitching every few months. This will be perfect for spring into early summer. Today we are off to the book fair. Every February they hold a huge book sale at our state fair grounds. 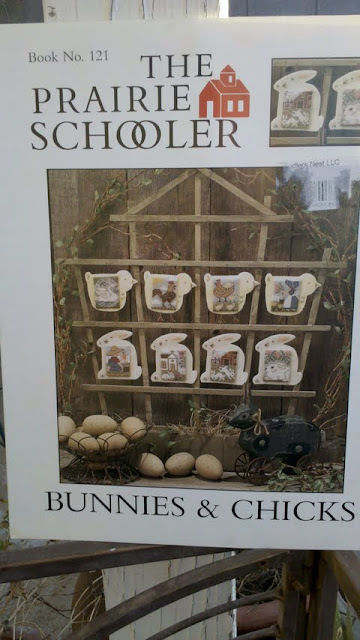 Sunday is half off of everything, and I always find some great crafting books and cross stitch charts while i'm there. The only part I don't like about it is man do people get pushy over tables piled with books. But I still love going. People camp out in the morning waiting for it to open, on Saturday they have rare/hard to find books. But they also have paperbacks for 50 cents and normally I get most of my charts for a dollar. Anyways it's something exciting to do on a lazy Sunday, and I so look forward to it every year. 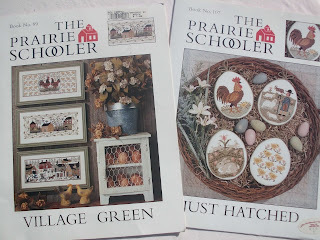 And in honor of my recent Prairie Schooler finish I thought I would have a little giveaway. I am trying to collect all the PS charts slowly but surely (I think I maybe am at about 40% right now), but sometimes I am not so organized and wind up with two of the same chart. This would be one of those charts. It is "Bunnies & Chicks #121". 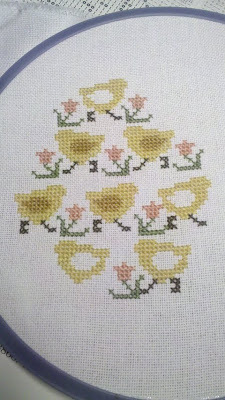 I stitched the little bunny last year into a cute ornament, and do love the designs on this chart. 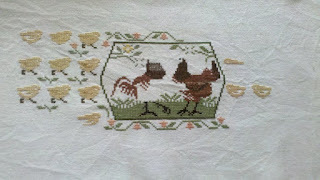 If you would like my extra copy (and perhaps some other stitchy extras thrown in) leave me a comment. Hope you all are having a great Presidents Day weekend, i'm off to buy some books! Why do I do this everytime! 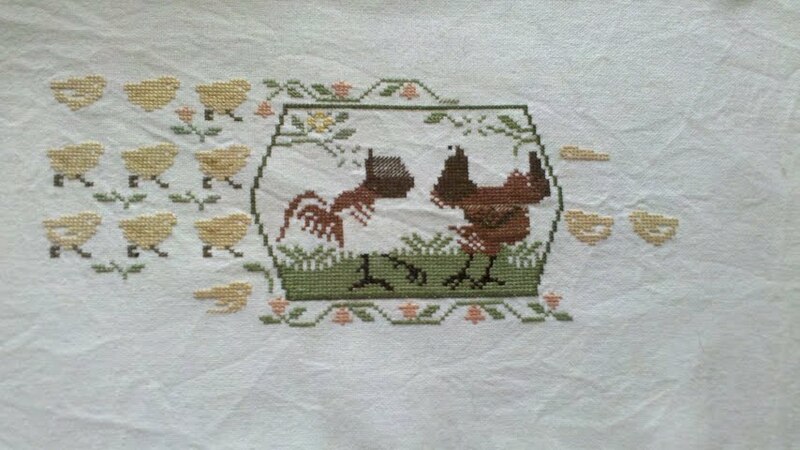 So this is my two weeks worth of progress on Prairie Schooler chickens. I have made a good bit of progress, but do you know what I do when I am steaming along on a piece and coming this close to finishing? I suddenly lose all motivation to finish and every other WIP in my basket starts calling my name. 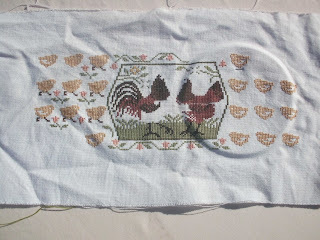 So even though I only have some little chick wings to go on this one, and even though it would probably only take me two hours of stitching or less to actually finish this one I suspect it's just getting farther away from being done. 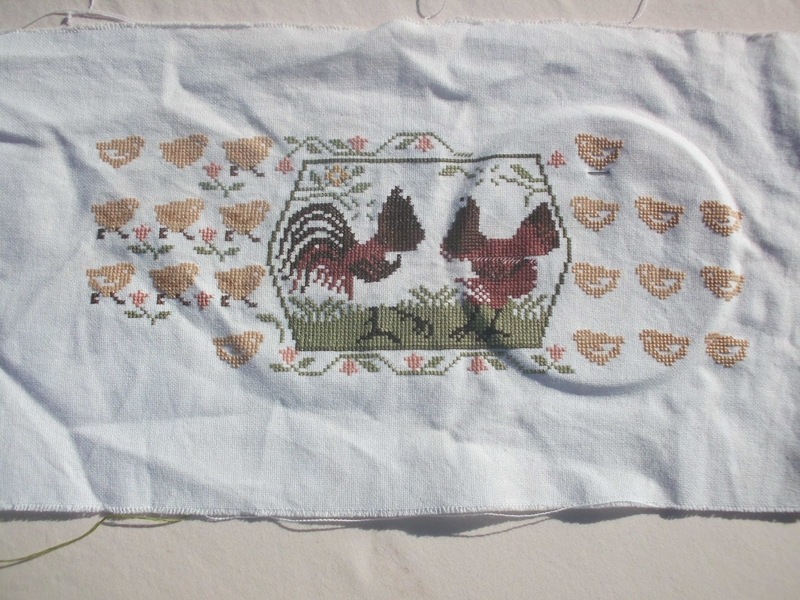 One of my favorite things about spring here in the desert is stitching outside in the sunshine. I have been doing lots of that this week, it is so much easier on my eyes to have natural daylight. Also it's been so nice here all week, in the 70's during the day. I take our two parrots out on the back porch with me and love watching the wild lovebirds (tiny bright green parrots) come to their cage to visit. 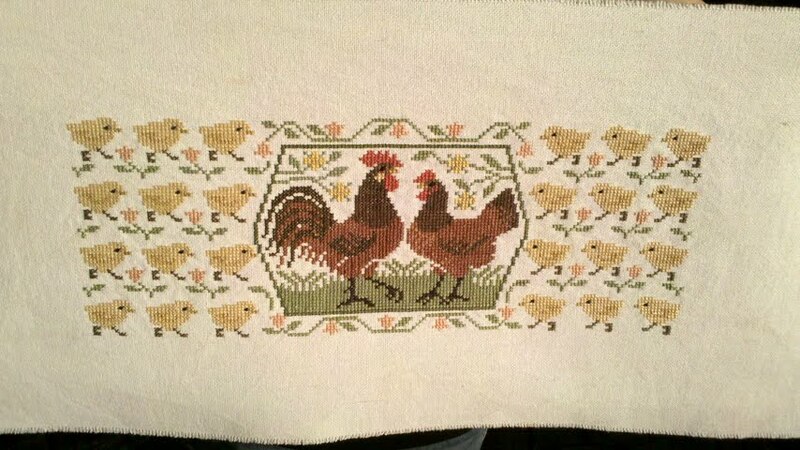 I had a few people ask on my last post what chart the chickens piece was from. It's the one on the left,"Village Green". I love how Prairie Schooler has so many different charts that coordinate so well with each other. I want to stitch the little chick ornament off of "Just Hatched" to go with my bigger finished piece.